Sturgeon meat has been a tossed-aside caviar by-product for ages, but Dan is eager to finally give it the audience it deserves. Sustainably sourced Northern Divine caviar and sturgeon are united at long last in a delectable pairing complemented by lorette potatoes. Sauce gribiche and chive oil add fabulous flavour to these “perfect little pearls” and pan-roasted fish. Presents beautifully on the plate. • In a large bowl mix together egg yolks, mustard, lemon juice (or vinegar), Canola oil, olive oil and salt. There you have a mayonnaise, the base for your sauce gribiche. Add in chopped parsley (or chervil), rinsed capers, chopped cornichons and diced shallot. Adjust seasoning as necessary. When the 2 eggs are done being hard boiled, crack them open and mix them into your sauce gribiche. • Blend all the ingredients together until it turns a vivid green and is of a fine consistency. • Simmer the potatoes in heavily salted water until just tender. Remove from heat and allow to steam dry. Slice lengthwise into quarters and reserve. Or you can slice them before adding them to the pot. • Season the fish well with salt on bother sides. Heat the frying pan and add a splash of Canola oil. Place the fish in the pan and allow to fry over high heat to form a crust for 2 minutes.Half way through add thyme and butter and turn the fish. Also at this time turn the heat off. Allow the butter to brown and the thyme to crackle. Use a spoon to baste the fish with the thyme infused butter. Drain on a paper towel. • On a rectangular plate, make a healthy line of sauce gribiche down the middle of the plate. Place three potato wedges in various spots on the sauce gribiche. Put one small, neat spoonful of caviar near each of the potatoes. Make sure the caviar is not touching the sauce gribiche. 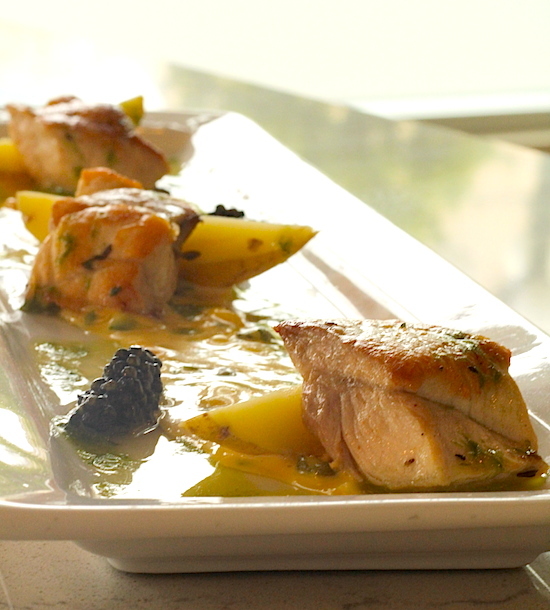 Lay a piece of the sturgeon on the opposite side of the potatoes from the spoonfuls of caviar. Finish by drizzling the chive oil on and around the sauce gribiche.